NEWS FLASH: Twist’s Concert Film, Like A Bridge goes live on iTunes and Google Play in September 2016. Doors at 7:00. Wine will be available. or call 1-800-838-3006.Tickets at the door $25. Students/Members at The Italian Cultural Institute may purchase advance tickets for $15 with a password obtainable from The Institute. BASTILLE SWINGS: Society Cabaret at Hotel Rex Union Square, San Francisco, presents their annual Bastille Day party, Saturday July 11, 2015 at 8pm, with the swinging, cosmopolitan sounds of Lua Hadar and her band Twist in C’est Magnifique! From Cole Porter to Charles Trenet, the show includes a variety of songs from the popular traditions of Paris. Lua’s fun and quirky stories give a personalized bridge to the songs, whether you speak French or not. Lua Hadar: French and English vocals, Jason Martineau: piano, Dan Feiszli: bass, Kelly Park: drums and featuring Dave Sturdevant on guitar and harmonica. TICKETS $25-45 (no fees) at http://bit.ly/1GAFDPU or by Phone at 415-857-1896. Carol Banks Weber in National Examiner.com talks about our Independent Music Awards nomination in a feature article with lots of photos. 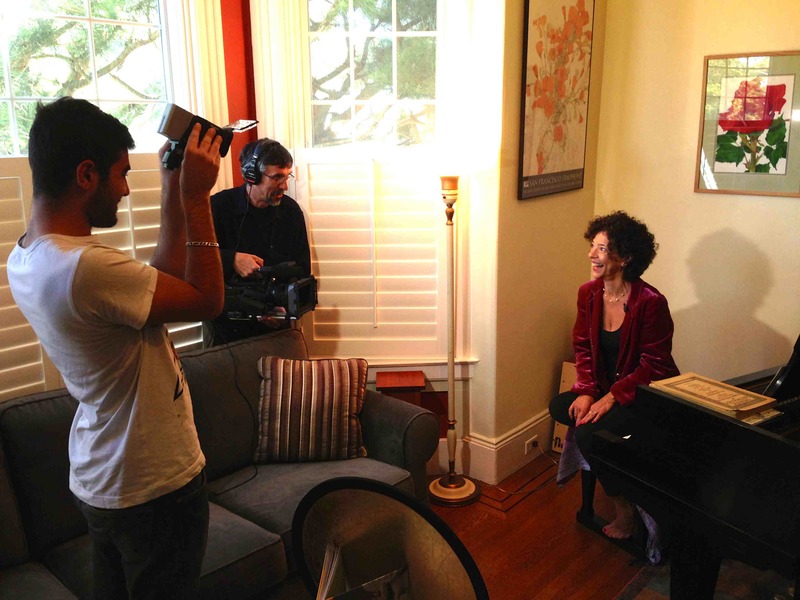 Lua was interviewed by French documentary filmmaker Christian Jeunet for his full-length feature San Francisco Beyond the Postcard. Direct from a sellout in Paris, ‘C’est Magnifique’ makes its USA debut at Society Cabaret at the Hotel Rex, Thursday through Saturday, Nov.14-16 at 8pm. 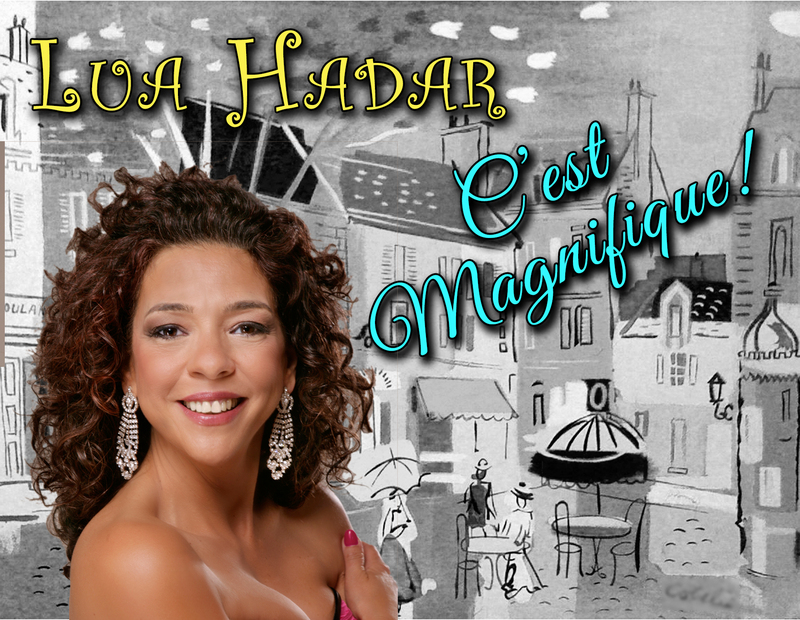 This retro floor show features the cosmopolitan jazz ensemble Twist, with Lua Hadar on French and English vocals, You’ll feel like you’re in a French Music Hall or a black and white movie. Full bar and delicious small plates available. The Hotel Rex is San Francisco’s answer to New York’s famous literary and cultural hangout, the Algonquin Hotel. Hotel Rex Union Square, 562 Sutter Street, San Francisco, California 94102. There are a limited number of General admission $20 seats on sale now, while they last. Prime seating tickets are $45. No booking fees!! See clips from the Indie Music Awards-nominated DVD on Yoshi’s new screen as the band rolls out new tunes live on stage. Lua on vocals, Jason Martineau on piano, Dan Feiszli on bass, Celso Alberti on drums, Ian Dogole on percussion and Larry De La Cruz on reeds. Next Live Show in Paris! « C’est Magnifique » Lua Hadar, Sheldon Forrest et Albin Suffys rendent hommage à Cole Porter, ainsi qu’à la chanson française et internationale, au Swan Bar. Gratitude to our Fans and Ground Team for the super time we had at the November 15 Movie Premiere of our Live Studio Concert LIKE A BRIDGE and bonus feature BUILDING BRIDGES at the historic Balboa Theater in San Francisco. Here’s a video of the evening! All About Jazz review by Geannine Reid 10/25/12 … a bold, worldly musical venture… Hadar’s grasp of various languages and vernaculars is vast, singing in English, French, Spanish, Japanese, Portuguese, Italian and Malagasy. What is more impressive is her command of each of the seven dialects’ dictions and supple inflections within the musical selections, and her phrasing of each melodic line…a bridge of musical delight that makes a truly global journey, introducing sounds from across the beautiful palette of diversity. Straight No Chaser 8/4/2012, Podcast by Jeffrey Siegel. Hadar and her band take a decidedly global approach to reinventing tunes without losing the spirit originals. Martineau takes a world beat approach to “Bridge”, and Hadar glides through the song on a wave of sonic bliss, sparked by solos from horn player Larry De La Cruz. There is a strong sense of timeliness throughout the album, thanks to the various languages it feels like one is drifting around the world. 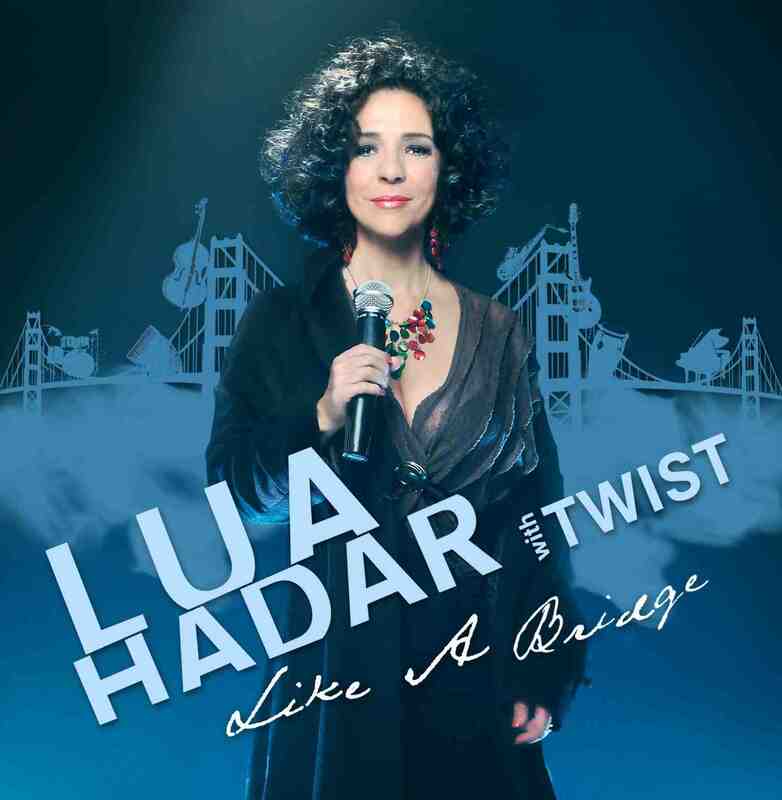 Lua Hadar brings out the inherent dramatic essence in all these songs and I imagine a live performance will be quite something to behold. …she and the band nail it live in the studio…sophisticated…another fine example of adult chill. 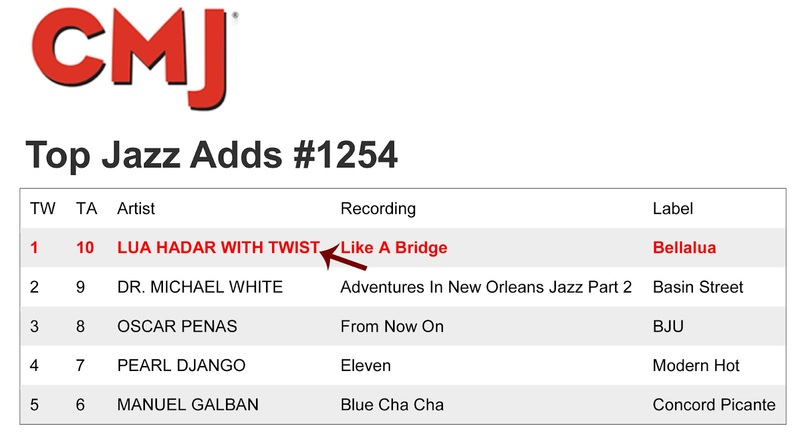 In the first week that the Like A Bridge CD was released to radio stations around the country it made #1 on the Top Jazz Ad Charts, and is receiving airplay from Maine to Alaska. The Like A Bridge CD is available on iTunes, at Amazon, CD Baby, and with most online vendors.